Was the federal home buyer tax credit worthwhile? I suppose it was helpful from a very short-term perspective --- it gave the market a boost between 2009-Q3 and 2010-Q2. But those artificially elevated sales levels didn't last -- sales declined to even lower levels after the tax credit than where they had been before it. Thankfully, the last year has shown steady growth in the number of home sales in Virginia, without the assistance of the tax credit. "In its latest construction forecast, the NAHB on Wednesday stuck to its guns that "underlying fundamentals" such as low mortgage rates, decent economic growth, and pent-up demand for housing will drive double-digit percentage increases in home starts this year and next, and reverse catastrophic declines in new and existing home sales." Read the entire story at Builder Online. Will my house sell this month? Housing markets are improving all across Virginia! The First Quarter 2012 Virginia Home Sales Report has been released and brings good news for the Commonwealth! Several long-term trends indicate that Virginia's housing market is continuing to stabilize. As shown above, the pace of home sales in the first quarter of 2012 marked an improvement over both the first quarter of 2011 and 2010. The median residential sales price has increased 2.4% in Virginia over the past year despite a slight (-0.5%) decline over a three-year time period. Download the full First Quarter 2012 Virginia Home Sales Report to find out more about how different regions in Virginia fared in the first quarter of 2012. Some would say for every buyer there is a house, and for every house there is a buyer. That doesn't really apply in a buyer's market. Accentuate the positives - Focus on the most desirable aspects of your home (floor plan? age? condition? neighborhood?) and promote those features or characteristics heavily. Overcome the objections - Be realistic about what buyers will be concerned about (steep driveway? small yard? busy road? damp basement?) and create a strategy for making buyers comfortable with those aspects of your home, instead of pretending they don't exist or hoping that buyers don't notice them. Promote creatively - Think critically about who the most likely buyer of your home will be, and how to best reach them with the wonderful news that your house is for sale. One marketing strategy and one set of marketing techniques is not a cure all for all properties. Price aggressively - When in doubt, sharpen your pencil and offer an overly compelling price for your home that will raise the eyebrows of potential buyers and get them to act now to pick your house instead of stewing over the decision for weeks, months or eternally. As suggested by the Venn diagram above, there are plenty of houses that won't be chosen by buyers this week, month and even year. If you want your house to be one that actually sells, be realistic about your house, and the market, and create an aggressive, creative, proactive strategy for moving forward. In talking to several potential clients this past week, I have explained that there are two sets of buyers we need to consider when preparing to list, market and sell your home. The first set of buyers - on the sidelines, ready to pounce . . . The second set of buyers - actual and contemplative buyers, over time . . . If we haven't sold your house in the first month of being on the market, in some ways we are then gearing up for the second set of buyers -- those who will be deciding to start looking for a house over the next few months and will then be perusing a wide range of houses as they determine what they are looking for, what they like, what they don't like, etc. This second set of buyers (who are stretched out over a longer time period) are not typically as specifically interested in your house as those first few buyers are who may show up in the first month of having your house listed for sale. So we should aim for the first set of buyers, right? Certainly, nearly every seller would like a buyer to commit to buy their home in the first few weeks that it is on the market. That is not always possible, but we can make that the goal depending on a few variables. Some houses are in under-supplied locations, neighborhoods or price ranges such that there will be pent up buyer demand, increasing the likelihood of a speedy sale. You can't move your house, or adjust many of these attributes, however, so we're either going to have supply and demand working in our favor, or not. You do, as a seller, have some control over pricing. The key here is to ask slightly less than what buyers will see to be a reasonable price. Conventional pricing strategy might suggest that we identify the fair market value of your house (for example $300K) and then price your home slightly above that (for example $310K) to allow for some room to negotiate. The problem with this strategy is that it doesn't make it compelling enough for buyers such that they'll want to act immediately upon seeing your house on the market. In this example, we'd be much better served to price your home at $299K such that a buyer can imagine being able to buy your home for $290K or $295K, and thus is willing to make an early, fast offer. There is plenty that goes into preparing your house to go on the market, and understanding the segment of the local housing market that your house fits into, but one serious consideration is how to best position your home for the two sets of buyers described above. Fooled by a narrow scope? Thanks a lot Dustin, now things are even more confusing. So, Dustin suggested that I examine data prior to 2008 to see if we could learn more about why single family home values surged in the City of Harrisonburg in 2010. Well, as you can see above, we may have been fooled by looking just at 2008-2012 data. I have highlighted (in yellow) the time frames when the City and County median prices were relatively similar. Now you'll note that there were two surges in values --- City values surged ahead in 2010 (and then stepped back into line) --- but before that, County values surged head in 2005-2007 before stepping back into line. What explains it? Gas prices? Home buyer tax credits? Wow, there were a lot of great proposed explanations for why Harrisonburg single family homes saw an increase in value (median sales price) between 2009 and 2012. Thanks to all for your comments and perspectives, most of which surfaced via Facebook. Thank you all for your perspectives, and for engaging in some thoughtful debate as to why single family homes performed better in Harrisonburg than in Rockingham County between 2009 and 2012. As to the Starbucks reward for fantastic insights, I'm calling it a tie between Brett and Karl. I'll be in touch to get each of you a Starbucks gift card. Stay tuned for the next time I get stuck figuring out the WHY of some of our local housing market data. Explain this to win a $10 Starbucks gift card: Why did single family home values diverge in Harrisonburg, Rockingham County between 2009 and 2012? I'll give a $10 Starbucks gift card to the person who can provide the correct explanation of the graph below. OK, I'll be fair, I don't know what the correct answer is. :) So, I'll give the gift card to the most believable answer. Leave your answer as a comment below, or e-mail me (scott@HarrisonburgHousingToday.com). The City of Harrisonburg is considering increasing the real estate tax rate from $0.59 per $100 of assessed value to $0.63 per $100 of assessed value. Rockingham County is also considering a $0.04 increase, from its current tax rate of $0.60 per $100 of assessed value to $0.64 per $100 of assessed value. To understand the potential rationale behind such an increase, let's examine funding levels given a few assumptions to make the math a bit easier. First, we will assume that all tax assessments are at exactly 100% of the market value of properties. Second, we will assume that both Harrisonburg and Rockingham County are comprised of 1,000 privately owned homes. Third, we will assume that all homes have market values (and assessed values) of the median sales price. As shown in the table above, the median sales price in the City of Harrisonburg declined 20% between 2008 and 2012 from $213,500 to $170,000. If the City of Harrisonburg were comprised of 1,000 median-priced homes, the tax base and thus the tax revenue would also decline by 20% from $1.26M to $1M. Even with the proposed $0.04 proposed increase in the tax rate (from $0.59 to $0.63) the tax revenue would still decline by 15% from $1.26M to $1.07M. In fact, the tax rate would need to increase to $0.74 (a 25% increase) in order to maintain the same tax revenue as in 2008 --- assuming that assessed values have tracked precisely with median sales prices. As shown in the table above, the median sales price in Rockingham County declined 20% between 2008 and 2012 from $215,000 to $171,750. If Rockingham County were comprised of 1,000 median-priced homes, the tax base and thus the tax revenue would also decline by 20% from $1.29M to $1.03M. Even with the proposed $0.04 proposed increase in the tax rate (from $0.60 to $0.64) the tax revenue would still decline by 15% from $1.29M to $1.1M. In fact, the tax rate would need to increase to $0.75 (a 25% increase) in order to maintain the same tax revenue as in 2008 --- assuming that assessed values have tracked precisely with median sales prices. click the infographic above for a printable PDF version. The bottom line here is that County properties seem to be under-assessed by an average of 10%. Most buyers pay more than assessed value for the properties they purchase. Rockingham County is considering raising the real estate tax rate from $0.60 to $0.64 per $100 of assessed value (details here). The City of Harrisonburg is now considering a similar increase, from $0.59 to $0.63 per $100 of assessed value. Of note, the City's real estate tax rate was $0.62 per $100 of assessed value very recently -- it was adjusted down to $0.59 per $100 of assessed value in the 2008 fiscal year. Thus, looking at this over six years (2007-2013) this is only an increase of $0.01 per $100 of assessed value -- thus an effective 1.6% increase in the tax rate over the past 6 years. Click here for the full article from the Daily News Record. 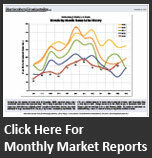 March 2012 shows a SURGE of buyers in the market! See above -- last month (March 2012) there were 87 contracts --- that is more than some of the summer months last year. We are likely due for a strong remainder of our spring housing market as well as a strong summer market based on the amount of buyers in the market these days. Of note -- even with Spring Break, and Easter, there have already been 28 contracts in the first 9 days of April. Harrisonburg and Rockingham County home sales were at a four year high during March 2012, and for the entire first quarter of 2012. Click here to jump to the PDF of the full market report, or keep reading. March home sales (66) were 8.2% higher than last March (61). YTD home sales (151) were 8.6% higher than the first quarter of 2011 (139). The YTD median sales price ($165,000) is up 0.6% from one year ago. The YTD average sales price ($186,450) is up 1.7% from one year ago. There is still plenty of room for improvement in our local housing market, but these positive trends are a welcome sign of further stabilization of the market. Though admittedly, an improving housing market is not good news for everyone. March 2012 was a fantastic month for home sales in Harrisonburg and Rockingham County, with 66 home sales closing -- the highest we have seen in the past four years. This sets the year up with a strong base as we move into the remainder of the spring and then summer market. The pace of home sales certainly varies based on price range. The graph above shows the average number of home sales per month (given a 12-month average) as we have passed through the past two years. You'll note that the sale of homes for less than $200,000 increased through June 2010 and then declined for the next 12 months. This phenomenon is almost positively a result of the federal home buyer tax credit that encouraged these sales during 2009 and 2010. Of note, however, this segment of the market (under $200,000) has shown steady increases since June 2011, as has the $200,000 to $300,000 market. Home buyers continue to find amazingly low interest rates on 30-year fixed rate mortgages, with the current average rate of 3.99% continuing the five-month streak of staying below 4.0%. There is plenty more to read, analyze and understand. Click here (or on the market report cover above) to download my full monthly market report. And -- if you have questions about the local housing market, or if I can be of assistance to you with real estate that you own, or that you'd like to own, please be in touch. You can reach me most easily at 540-578-0102 or scott@HarrisonburgHousingToday.com. Two of the houses that I have recently listed sold in less than one week. How, you might ask, was this accomplished with such an expedient time table? Certainly, pricing (strategic, aggressive) and marketing (thorough, professional) have something to do with these sales coming together so quickly, but there is something more about each of these houses. In a nutshell, both of these homes are in under-supplied segments of the market -- where there are far more buyers than there are sellers. Fast-selling-house-numero-uno: Under $300K, in the Turner Ashby school district, with 4 bedrooms and 2.5 bathrooms, built relatively recently, in good condition in a nice neighborhood. Fast-selling-house-numero-dos: Under $150K (barely), out in the country, but not too far from the main roads, on two acres, with updates to the house, with character, with detached building featuring a shop and home office. Suffice it to say that there were lots of buyers who were looking for these types of homes (#1 and #2 above) and now that both are under contract, there aren't too many other similar homes on the market for the remaining buyers to consider. Thus, if you have a home described in one of the two categories above, it is likely quite marketable. Sometimes it is not possible to know your home is in an under-supplied segment of the market --- but it is an important perspective to consider as you are preparing to put your house on the market. I am seeing more and more properties these days advertised for rent on Craigslist that are not really available for rent. They are typically properties that are really listed for sale -- and some Craigslist scammer grabs the photos and listing information from the web and promotes the property for rent on Craigslist. If you e-mail the supposed owner of the property through Craigslist you'll usually discover that they had to relocate internationally and thus they just really need to find a tenant. They are typically offering properties for lease at ridiculously low rental rates -- so low that prospective tenants seeing the ads on Craigslist almost already know that it is a scam. If it seems too good to be true, it probably is! Before you mail away your money (never to be seen again) to a property owner who advertised their property for rent on Craigslist, you might want to first check to see if the property is also listed for sale, and if so, verify the supposed owner's story with the actual owner's Realtor. Yes, this is a buyers market, but you still will not be able to steal a house. I certainly think buyers should be able to get a good deal on a house in the current market -- after all, there are more sellers than buyers in the market. And maybe, sometimes, buyers will get a great deal. And occasionally, an unbelievably amazing deal. But some buyers seem to think they should be able to steal any house on the market. Oh, I like that one that is listed at $225K. Let's offer $175K -- they'd be lucky to have me buy it for $175K! Hmmm, OK, so they're asking $375K. I would only be willing to pay $310K for the house -- I mean, c'mon, it is a buyers market, right? It is important for both buyers and sellers to have a firm understanding of what to expect in the current market. Are you just starting to consider buying or selling? A great starting point is my monthly market report, or I'd be happy to meet with you to give you a thorough understanding of our local real estate market -- and help you set reasonable expectations for buying or selling in today's market. Feel free to e-mail me (scott@HarrisonburgHousingToday.com) or call me (540-578-0102) to set up a time to meet. If I had been a bit more timely, and had broken this news about a week ago, I might have told you that THE SKY IS FALLING, LOCK IN AN INTEREST RATE NOW. Indeed, mortgage interest rates made a considerably two week jump from 3.88% to 4.08%. Many predicted that the end of low mortgage interest rates was nigh. As is typical, one data point can distort one's perception of reality. So, let's take just one more data point and reassure ourselves about our previous perception of reality. :) As you'll see above, the jump to 4.08% may have been an anomaly, as average interest rates fell back below 4% the following week. The big picture is something we've known for a WHILE now -- these ridiculously low mortgage interest rates won't last forever -- though it could be quite a while before they may any meaningful increases (over 4.5% or 5.0%, for example). Income from property taxes would make up 23% of County revenue in the coming year, up from 21% of revenue in the current budget cycle. The overall size of the County budget is proposed to decline -- from $310M to $298M. The real estate tax rate is proposed to increase by 7%, from $0.60 to $0.64 per $100 of assessed value. More details here.